I love trying new foundations, because who doesn’t want that flawless look? Since I have always struggled with my complexion I really need a good coverage foundation. During my search I have found Lancome teint idole ultra 24h, I would consider this to be a medium/heavy coverage. It feels super light on the skin which surprised me, and doesn’t melt off.. at all. I have worn this foundation and worked out and it was still in it’s place, it’s formula is very breathable. When I have breakouts (almost daily) I need to use a very good concealer in combination with this product. This foundation does not act as a concealer like other foundations I have used in the past. On the areas where I have old discoloration or dark spots it works amazing and really blends super nicely to look like natural skin and almost like you’re not wearing any foundation. This product does not last 24 hours like they claim it’s supposed too, I have tried three different types of primer even. It does however last 12 hours on my skin, which impresses me. Everyone has different skin so it may last longer or less hours than it might on another person. I do absolutely love the shade selection! I found the best way to apply this foundation was with a stippling foundation brush. I tried applying with my fingers or with a non-latex makeup sponge and it does not work well. I even tried other foundation brushes and they all work but not nearly as nicely as this one does. 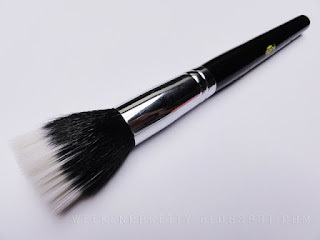 I start with one pump on the back of my hand and dab the stippling brush lightly into the foundation, and then slowly buff in circular and dabbing motions on my face until I get the desired coverage. I do end up using 3 pumps (on a bad day), I would start off with a pump at a time so you’re not left with any waste. When applying any foundation always remember to blend into the neck, so you're not left with any harsh makeup lines. Here is a picture I found that looks almost identical to the stippling brush I use. Lancome - teint idole ultra 24h retails for approximately $50.00, I purchased mine from Shoppers Drug Mart. Not all Shopper Drug Mart locations carry Lancome products though. To give you a little background on why I tried Lancome - teint idole ultra 24h, after I fell in love with Kat Von D Lock-It Tattoo foundation I was informed that the product was on backorder. So after waiting on a list for three months and living off samples Sephora kindly gave me, I decided to venture off and find something else that might work. On my search I couldn’t find the right shade for my skin tone, I always...ALWAYS have this problem. Lancome is the first foundation out of many that provided a shade very close to my skin tone, just like the Kat Von D one did. So if you’re struggling with finding a shade that works, I highly recommend Lancome brand foundations. Once I am done this bottle of Lancome - teint idole ultra 24h I will be repurchasing. I hope this review was helpful to you, if you have any questions please feel free to comment below! This occurred Saturday at UFC Fight Night 136 in Moscow, where former strawweight champion Joanna Jedrzejczyk was a guest fighter. Right off the bat, first query, she had been requested for her forecast of Khabib vs. McGregor, and she gave a neutral reaction. I'm 50/50. I'm a large fan of Conor, and I am a huge fan of Khabib. Two different styles," Jedrzejczyk said. "As you saw, I do not predict a battle. I really don't want to forecast the fights. People can accomplish this. They could predict my fights, but I never do that. Anything and everything can happen in the fight. This is surely the battle of, what, such as the century? In MMA. So I can't wait to see two great warriors fighting each other. I am 50/50.